This continues the post on Paper “Cut-out Cookies”. Clink on the link below to view that tutorial. In this post the use of ephemera in making paper “cookies” is discussed. This category of cookie crafts will be continued in “Post # 10C: Craft Foam Cookies”. Take the use of ephemera in this craft project a step further and create a true “memory craft”. Simply choose a “paper” that has a special meaning to you and a cookie cutter that fits the theme. Take the time to “journal” significant information about the ephemera and what it means to you on the back of the ornament. 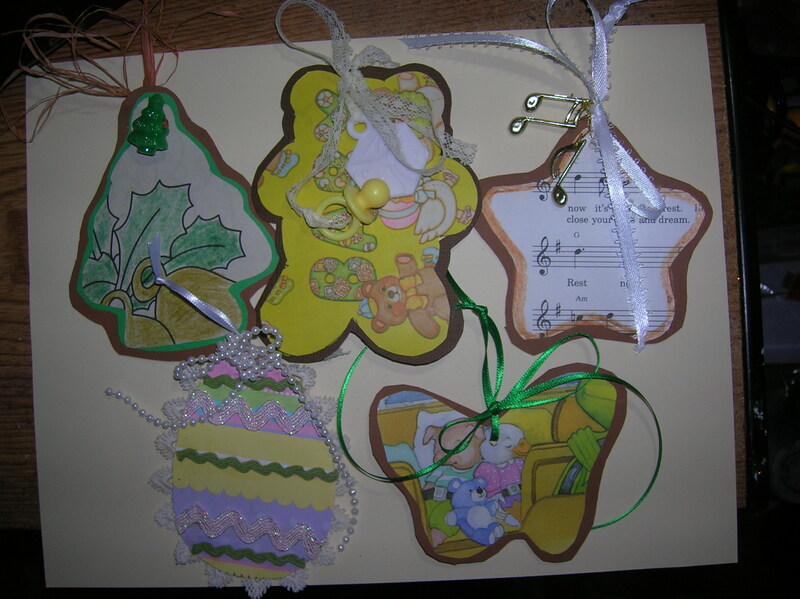 Ephemera can also be used to create Scrapbook Paper Back Cookie Cutter Ornaments. Simply use an ephemera item in place of the scrapbook paper. Clink on the link below to view that tutorial. Some paper or cardstock or cardboard ephemera examples are listed below. This is of course not a list of every ephemera item it is possible to use. Ephemera are transitory written and printed matter not intended to be retained or preserved. Re-claimed gift wrap from baby shower, etc. Trims: ribbon, jute, rick rack, lace, etc. Embellishments: jingle bells, buttons, sequins, googley eyes (for gingerbread people), mini candy canes, foam or paper punches, etc. I had all the materials on-hand so this was a FREE craft for me. The cost of the project depends on the type of paper used. I would recommend using scrapbook paper and cardstock for these ornaments for esthetics. Scrapbook paper and cardstock used the project would be dependent on the number of ornaments you would like to make between and could be $1 or less for one or two ornaments up to $10 for dozens. Wait until paper and cardstock are on sale or use a coupon to reduce the cost of these ornaments. Use of ephemera would be based on the cost of making a colored copy of irreplaceable items that you wish to retain the original of: old photos, baby book entries, journal entries, letters, etc. See the previous post “Not Just For Cookies Anymore! Post # 10A: Paper Cut-out Cookies”(link above) for instructions. Project specific directions are listed below. Choose Your Paper: You can make these with almost any type of paper or cardboard ephemera. Some materials you can use are listed at the beginning of the post. Almost any paper or cardboard item can be used. For the examples I used re-claimed gift wrap, a coloring book page, and a loose page from a children’s book. To re-claim gift wrap flatten and fold it into squares as the presents are unwrapped. Store it in a plastic tote or in file folders store it in a plastic tote or in file folders labeled with the pertinent information about the occasion (date, and stories about the event, whose present this wrap came off of, etc.). Cut the re-claimed paper in shapes that “matches” the design of the paper; for example: Cut stars and rocket ships out of paper with and astronaut design. When using ephemera items that are irreplaceable and that you wish to keep the original intact, make a color copy of the item and then use the copy (check the ink for colorfastness if you plan to use Mod Podge. Some inks may run.). 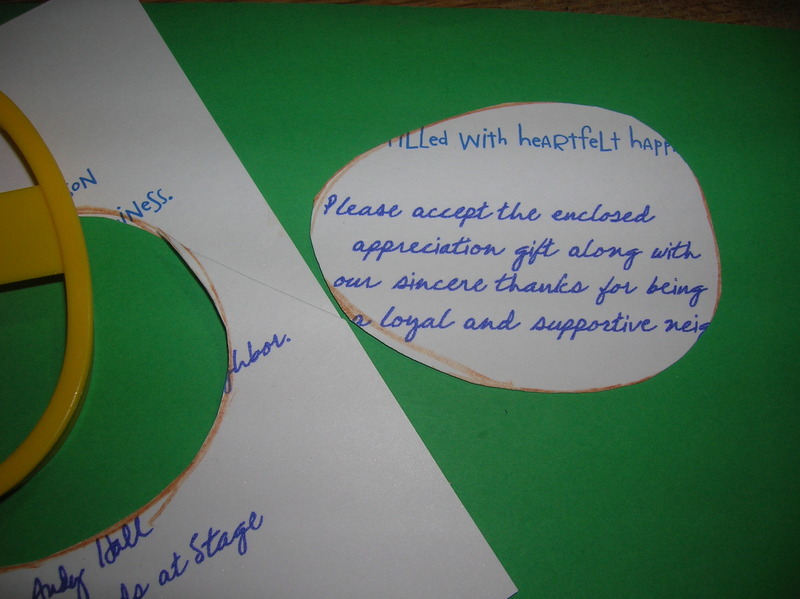 For example: If you would like to make package decorations for the family for Christmas using a letter written by your great-grandmother, determine how many usable cookie cutter shapes you can get from a copy and then make as many copies of the letter and use them so the original remains intact. Choose Your Cutter. When using ephemera items select a shape that fits the theme of the item. Choose a cutter that is large enough for the text/image/design that you want displayed to fit inside the cutter. It is best to use an outline cutter for this project so you can see that what you want displayed on the ornament is visible inside the shape. For example: A newspaper birth announcement could be enlarged and then made with a teddy bear shape large enough for the whole announcement to fit within the cutter outline. 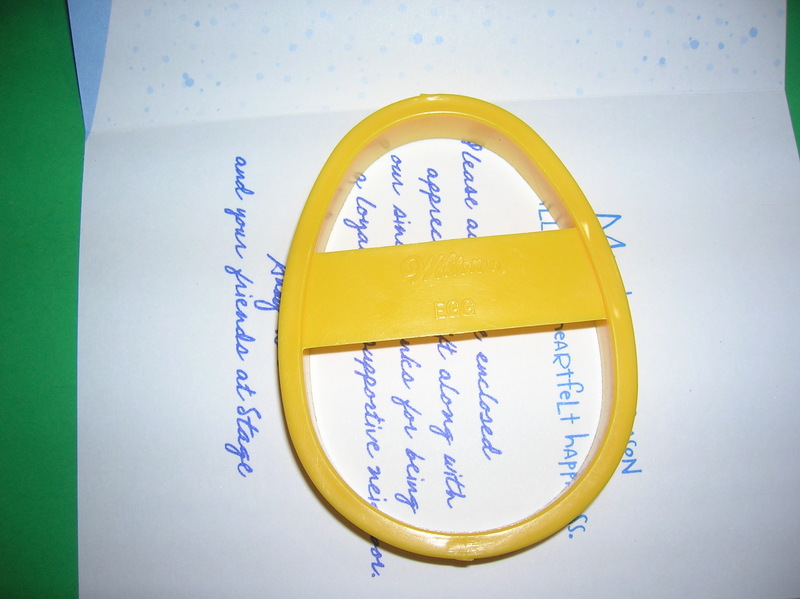 If the item itself is too small to fit inside the cutter, glue it to cardstock and the trace and cut the shape. Trace The “Icing”: The “icing” part of the “cookie” will be cut from ephemera. Arrange the cookie cutter on ephemera item carefully in order to maximize the use of the design/text of the item. Move the cutter around until the pattern of gift wrap, text you would like highlighted, photo elements you would like to display, etc. are clearly visible inside the cutter and then trace the shape. This is different than the last post’s instruction where you place cutter to maximizing the use of the paper. You can also use the ephemera as a backing for the ornament. Giftwrap Bear: You save that baby/wedding/etc. paper and don’t really have a plan to use it!!! So here is a way for you to use the paper. And if the baby is 17, go ahead and make one of these memory ornaments for their first Christmas tree away from home! I used baby shower paper as the “icing”. Mine was some vintage paper I had on-hand but you can re-claim giftwrap from a family/friend shower. As the design did not fit within the cutter horizontally, I turned the cutter so the “BABY” design is vertical. Use ribbon from a baby shower gift as the hanger (I used narrow lace). Save the table scatter from the baby shower to embellish the ornament – I used some collected from past showers I attended. Write the birth announcement details or a message for your child on the back with a permanent marker. Use a silver metallic marker (Sharpie) for dark paper and a brown marker or ink pen for light paper. Use these ornament to create a unique and highly personal “Welcome Baby” wreath for your daughter – use paper saved from her baby shower for this child and the paper from your shower when you were pregnant with her. Tree: For the “icing” I used a page from a coloring book that was already colored. I moved the cutter around until I was satisfied with the design inside the cutter. Coloring pages need to be reinforced by gluing them to cardstock. I choose to cut the tree out before reinforcing it on green cardstock. Then I trimmed it and left a green border. You can also roughly cut around the traced shape and then glue it to cardstock and then trim it the reinforced shape. To embellish the shape, I threaded a Christmas tree pony bead on raffia and then threaded the ends through a hole punched in the top and tied it off as a hanger. Secure the pony bead to the ornament with a Glue Dot. I tied some short pieces of raffia on the hanger and frazzled them. This would be a great place to use curling raffia if you have it. Egg: You can either use the ephemera item as the “icing“ on the “cookie” or as a backing for the ornament. For this ornament I used a card as the ephemera item and traced the message on the card for the backing of the “cookie”.. Choose a cutter that is large enough to fit the message that you want displayed. 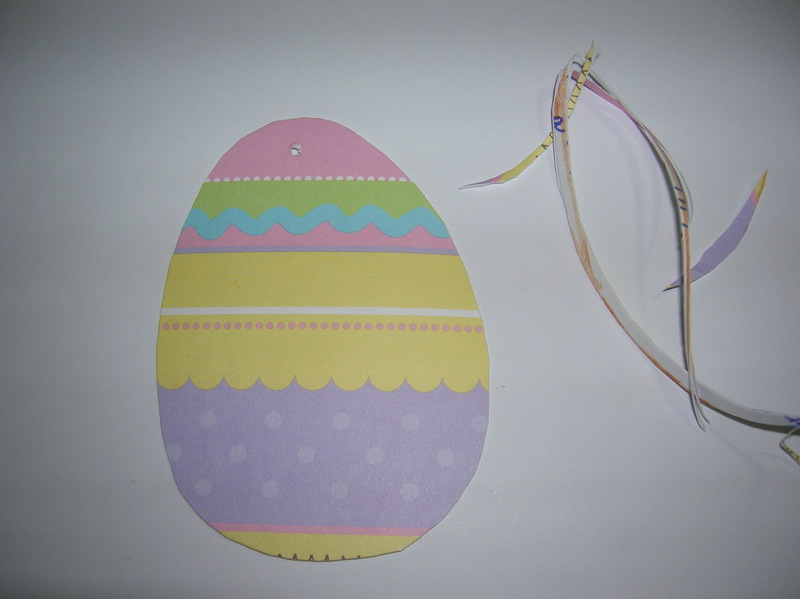 After cutting roughly around the egg shape I glued it to scrapbook paper. Because the message I used was on cardboard already I did not have to reinforce it before gluing it to the paper. If you are using paper (like a letter) glue it to a thin piece of cardboard and rough out the shape with scissors. Then glue the reinforced message to the scrapbook paper and then when dry, trim on the trace line. Gluing the ephemera item to the scrapbook paper before trimming ensures that both shapes match perfectly. I then glued some trim to the front and back. When using text test the ink on a scrap piece with glue to see if the ink is color fast. 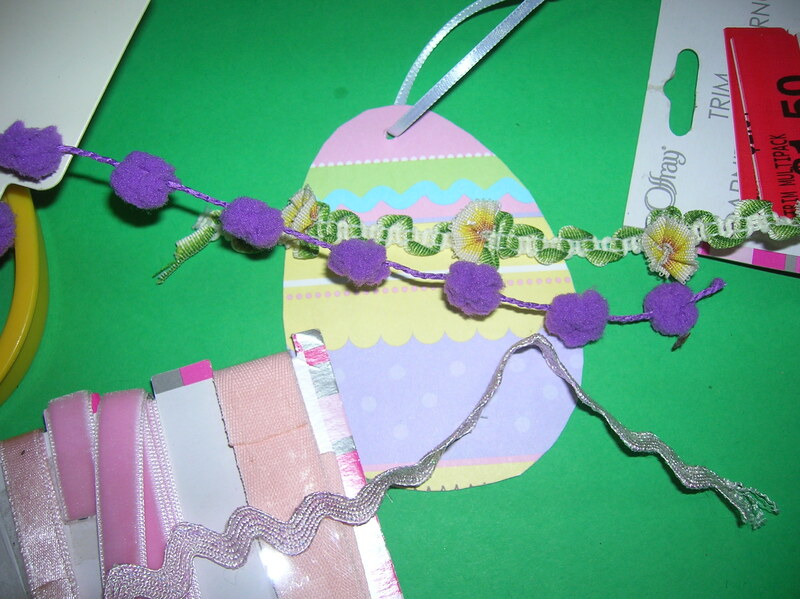 If it is not, then use tape runner or a cool melt glue gun to attach embellishments. I found this out the hard way and you can see where the ink smeared. To finish off the ornament I tied a bow on using a string of small beads. As it is hard to keep a bow tied with a bead strand tied, secure the bow to the ornament with a Glue Dot to keep it in place. When using the ephemera item as backing you can also create the “cookie” effect by tracing the cutter shape out of the scrapbook paper, cut it out, and then glue it to tan or brown cardstock and trim the edges leaving a border. Next glue the shape cut from the ephemera to the back of this “cookie”. There will be a brown border around the edges of the ephemera. Star: To make this star I used a book that has songs with the musical score. I traced the shape and then went back over the trace line with a colored pencil and widened and darkened the line to create a border. This border helps define the shape. To embellish the ornament I added some gold plastic musical note mini Christmas ornaments. This would be a great gift to give to fellow choir members. 5. Butterfly: I used a children’s book page to cut the “icing” shape from. I don’t have any embellishments that fit the theme or shape, so this ornament has a simple bow. It would be cute to use one or two book beads or buttons to embellish this ornament. Move the outline cutter around until the text, photo element, desgin, etc. that you want to showcase is displayed. Cut out the traced shape. Glue the ephemera shape to scrapbook paper and trim. An alternative is to trace and cut a "same shape" out of scrapbook paper and glue it to tan cardstock so the cookie cutter shape witl have a "cookie" border. Then glue the epemera shape to the back of the "cookie". There will be a tan border on the back as well as the front. Choose decorative trim for the ornament. Punch hole and add hanger.